You can add some magic to your stay by including a Disney-themed In-Room Celebration, available with Walt Disney Travel Company packages booked at Walt Disney World® Resort hotels, the Walt Disney World Swan and Dolphin Hotels, the Four Seasons Resort Orlando at Walt Disney World Resort, SpringHill Suites at Flamingo Crossings and TownePlace Suites at Flamingo Crossings. These one-of-a-kind celebrations allow you to celebrate special occasions in an unforgettable way. 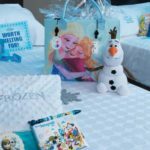 A Frozen Warm Welcome – Your Clients can enjoy a Frozen In-Room Celebration prepared for the whole family in their resort room! 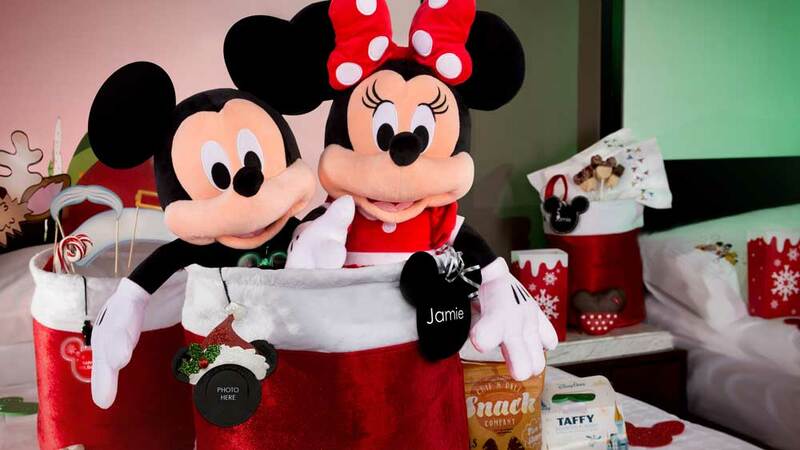 Dreaming of a Disney Holiday – Holiday dreams can come true with this exclusive Disney Christmas In-Room Celebration. My Magical Triumph – Achieving a goal, or overcoming a great obstacle, is something that deserves recognition, and we know just the mouse to help you celebrate in style! 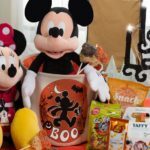 Mickey’s Halloween Celebration – A Halloween surprise starting with a light-up Mickey pumpkin sash over the door of your Clients’ Walt Disney World Resort room. You love them more than anything; let them know by giving the ultimate romantic Disney In-Room Celebration. The romance begins when your loved one opens your Walt Disney World Resort room door to discover scattered rose petals illuminated by the soft glow of flameless candles. A half-dozen pink roses accented with delicate flowers and greens accompany the stunning arrangement. 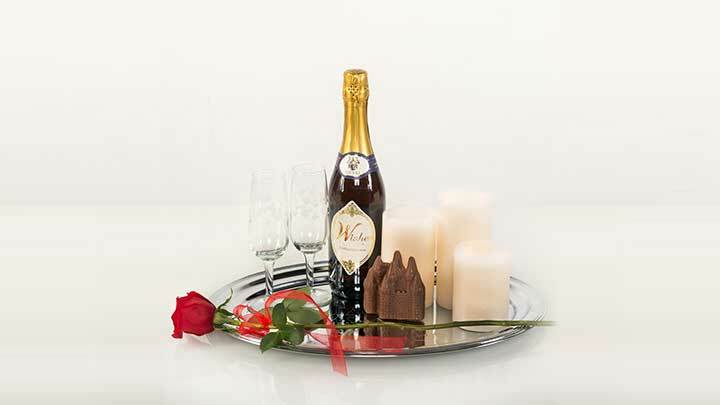 A sparkling silver Castle tray sits nearby and features two drink flutes, a decadent celebratory beverage, and chocolates. Make a toast to all your dreams coming true in the comfort and charm of your resort room. Enjoy the magic of your lives together at the Most Magical Place on Earth! 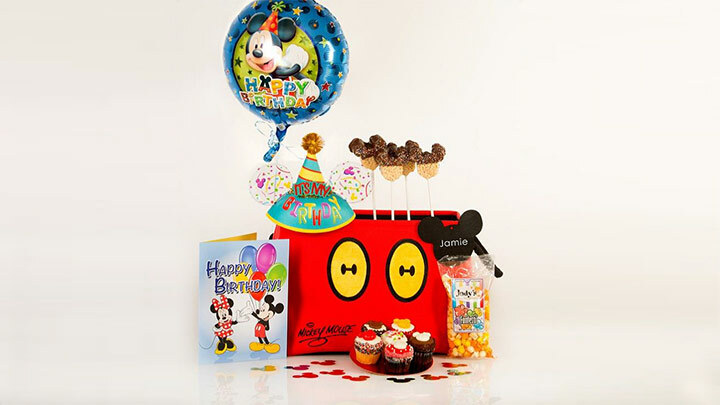 Brighten your loved one’s birthday with a celebration from Mickey Mouse or Minnie Mouse they will remember for years to come! A birthday door sash hangs on the outside of the Walt Disney World Resort room door to announce something special is waiting on the other side. Walk into a room sprinkled with confetti and a birthday balloon bouquet. 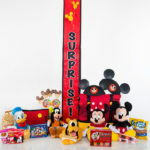 An assortment of gifts awaits, including a Happy Birthday ear hat, a Mickey or Minnie plush and pillow blanket, along with a light up lanyard. Completing the celebration is a tray filled with yummy snacks and treats to be enjoyed. Get ready for a warm welcome from your favorite Disney pals that’s full of character! A “Surprise” door sash hangs outside of your Walt Disney World Resort room door to announce something special is waiting on the other side. Inside, the Fab 5 join you to celebrate your Disney visit with fun and easy to travel treats and surprises for the whole family. A Mickey themed tote bag, Mickey ear hat, and pillow blanket all wait to be discovered with a special message from Mickey in an official autograph book! 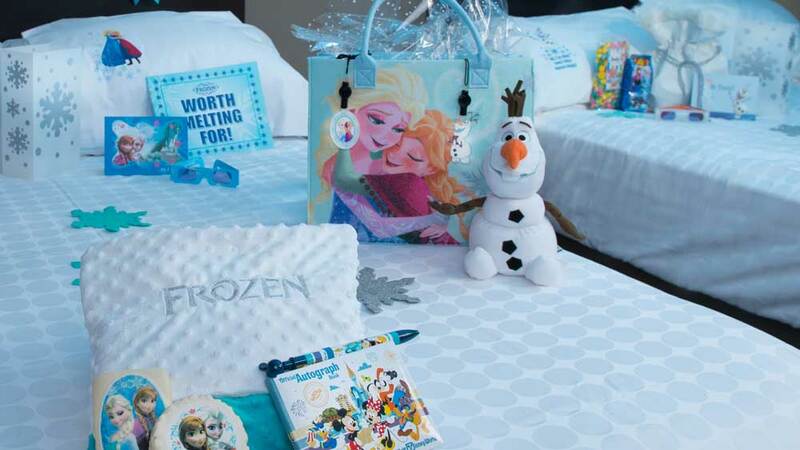 Enjoy a Frozen In-Room Celebration prepared for your family in your Walt Disney World Resort room! The surprise begins upon discovering a Frozen-themed door banner. Peek inside to see snowflake confetti and luminaries lighting the way to an experience full of magic. Loved ones will feel as if the royal sisters of Arendelle came to the room when they discover the Frozen-themed pillow blanket, pillowcases, and tote filled with delicious goodies and treats! For fun in the parks, Anna, Elsa and Olaf left Frozen Vision glasses featuring custom holographic lenses to see the world through their eyes, along with an exclusive light-up lanyards. Loved ones will also enjoy the autograph book and Frozen themed photo memory cards for a touch of personality in every photo. The magic truly comes to life in the room when they discover the surprise Olaf plush, great for warm hugs after a full day in the parks! Add personalization to your gifts to create treasured Frozen keepsakes. Personalization is available. You did it! Achieving a goal, or overcoming a great obstacle, is something that deserves recognition, and we know just the mouse to help you celebrate in style! 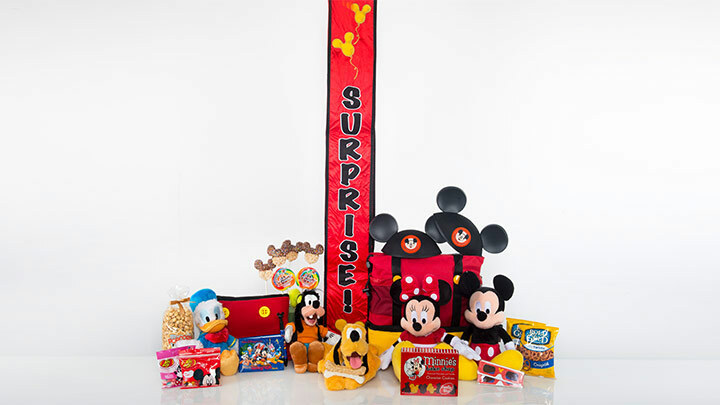 Arrive at your Walt Disney World Resort room to find a “Surprise” banner hanging outside the doo r. Inside, discover decorations and gifts left by your pal, Mickey Mouse! 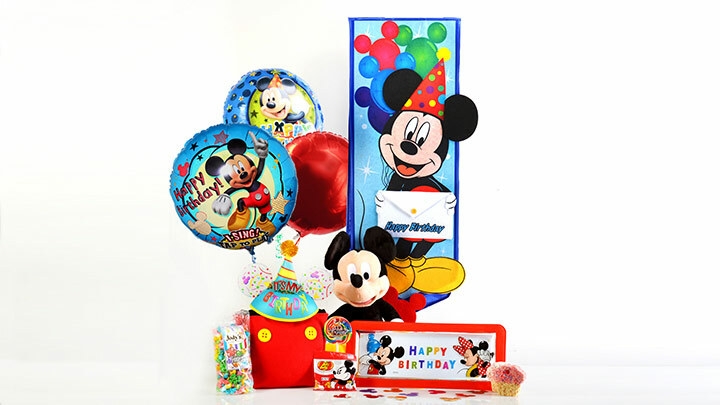 A “Celebrate!” pennant hung on the wall, festive balloon bouquet, Mickey Mouse confetti, and a giant Mickey Mouse surprise box will kick off your celebration. Open the box to discover the exclusive My Magical Triumph medal – a treasured symbol of your achievement. A framed declaration honoring your triumph, and signed by Mickey Mouse, is among the treasures you will discover. Mickey Mouse isn’t the only one who wanted to congratulate you though; look around your room for Tinker Bell! Give your loved one a pat on the back with a congratulatory Disney In-Room Celebration they’ll never forget. Personalization is available. Mickey Mouse heard you were visiting so he created a Halloween surprise starting with a light up Mickey pumpkin sash over the door of your Walt Disney World Reso rt room. As you enter, discover a welcome letter from our favorite pal letting you know surprises await! 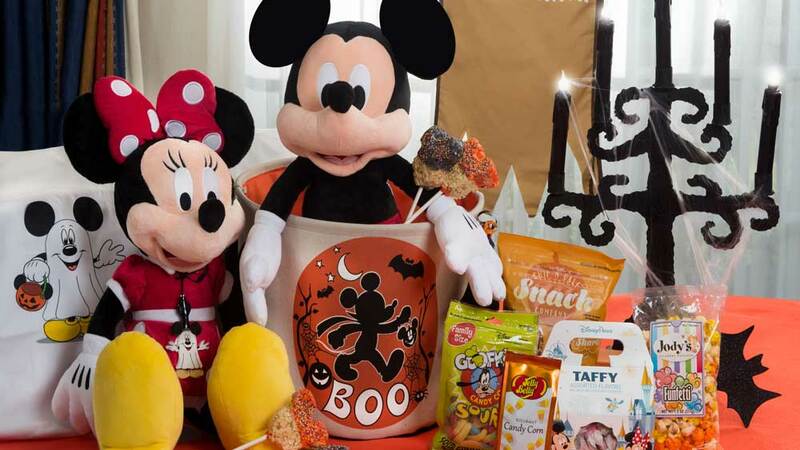 Next to the letter, Mickey Mouse and Minnie Mouse plushes greet you with a one-of-a kind keepsake character bin holding popular Halloween treats. Nearby, a festive blanket, creepy candelabra, luminaries, cobweb and activities fill the room. 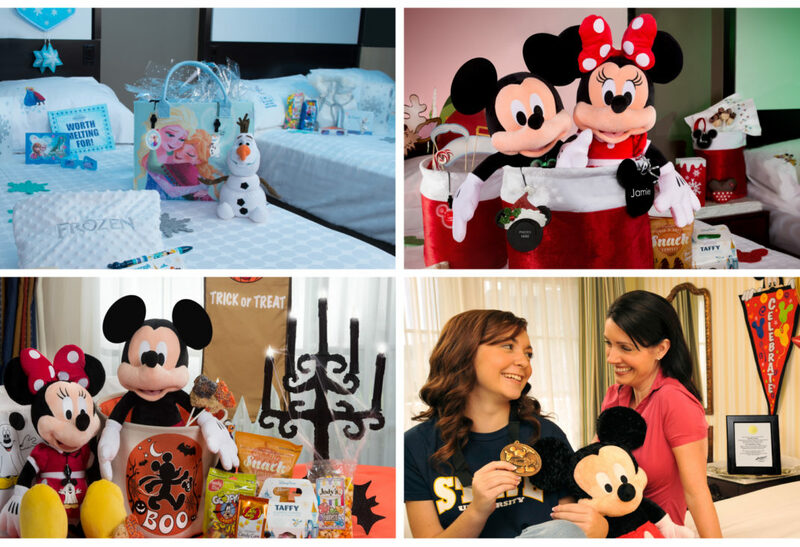 Surprise your loved one with this Disney Halloween In-Room Celebration. 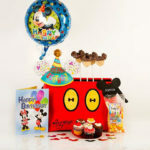 Personalization of your gifts and surprises available for an additional fee. Offering is subject to change without notice and may depend on current availability of selected product. Personalization is available. In-Room Celebrations cannot be added within seven days of arrival. They are never delivered on arrival date, but rather the second day of the stay. 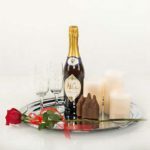 Packages can have multiple In-Room Celebrations Experiences. 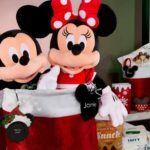 Available at Disney Resort hotels, the Walt Disney World Swan & Dolphin Hotels, the Four Seasons Resort Orlando at Walt Disney World Resort, SpringHill Suites at Flamingo Crossings and TownePlace Suites at Flamingo Crossings. 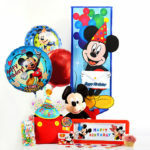 Disney Floral & Gifts may substitute any product, as necessary, to maintain the integrity and quality of the gifting experience. In-Room Gifting Experiences are non-refundable due to the customized content. The following delivery dates are not available: New Year’s Day – January 1st, Independence Day – July 4th, Thanksgiving Day – 4th Thursday of November, and Christmas Day – December 25th. For In-Room Celebrations with personalization, be prepared to provide Guest’s contact name and email address to plan the details of their personalized in-room experience. They will be contacted within ten days from the date of purchase.